Founded in Taiwan by Chiang Kai-shek, the Rev. 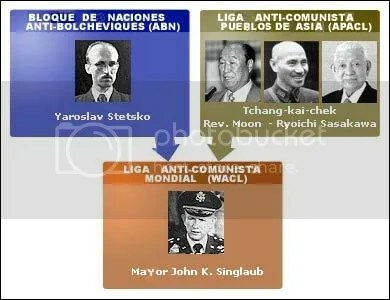 Moon and Nazi war criminals and Nippon, the World Anti-Communist League (WACL) was first used by Nixon to extend the methods of counterinsurgency Southeast Asia and Latin America.Seven heads of state then participated in their meetings. Later, came alive again in the Reagan era, becoming an instrument of U.S. military-industrial complex and the CIA during the Cold War. He then ordered political killings and the formation of the counterinsurgency in all conflict areas, including in Afghanistan where he was represented by Osama Bin Laden. After the Second World War, the U.S. Secret Service agents used Nazi Ustasha fascist and anti to create a network, you stay-behind . If agents recruited in the future states of the Atlantic Alliance should remain secret, those States that had fallen under Soviet control were, however, to act publicly. Was created, therefore, in 1946, a sort of international entity to coordinate the actions of the players from the East transferred to the West: the Anti-Bolshevik Bloc of Nations (Anti-Bolshevik Bloc of Nations, ABN). Ukrainian fascists, Hungarians, Romanians, Croats, Bulgarians, Slovaks, Lithuanians, etc. met under the direction of Yaroslav Stetsko. Ex-collaborationist leader in Ukraine, Stetsko is held responsible for the slaughter of 700 people, mostly Jews, committed in Lvov on July 2, 1941. Eight years later, at the end of the Korean War, the United States replaced France in Indochina . President Eisenhower established a regional defense system directed against the USSR and China. On September 8, 1954, following the model of NATO, SEATO was created which brings together Australia, New Zealand, Pakistan, Philippines, Thailand, the United Kingdom and United States. On December 2 the device is completed with a bilateral defense treaty between the U.S. and Taiwan . In parallel, the CIA, under the direction of Allen Dulles, the intelligence structure of these states and provides an organization of anti-party links in the region. It is well, around the same Chiang Kai-shek, an Anti-Communist League of Peoples of Asia (Asian People’s Anti-Communist League, APACL). In addition to the Taiwanese president Chiang Kai-shek, the APACL counts among its members Paek Chun-hee, the future president of South Korea; Ryiochi Sasakawa, a war criminal, a millionaire and benefactor of the Japanese Liberal Party, and the Reverend Sun Myung Moon , prophet of the Unification Church. Also appear in the ranks of the General Prapham APACL Kulapichtir (Thailand), President Ferdinand Marcos (Philippines), Prince Sopasaino (Laos) , Colonel Dang Cong Do-representative of President Nguyen Van Thieu, Vietnam) , etc. L’APACL is under the control of Ray S. Cline, then chief of the CIA station in Taiwan , and publishes the Asian Bulletin, which is drafting by Michael Lasater, future head of the Department of Asia at the Heritage Foundation . Since 1958, the president of the Anti-Bolshevik Bloc of Nations (ABN) participates in Taipei at the annual conference of the Anti-Communist League of Peoples of Asia (APACL). Stetsko Cline and oversee the establishment of the Political Warfare Cadres Academy in Taiwan, the institution responsible for training the cadres of the regime of Chiang Kai-shek for anti-repression. The academy is the Asian equivalent of the Psychological Warfare Center in Fort Bragg (USA) and the School of Americas in Panama . Gradually, the CIA is a network of political groups and trainers in global counterinsurgency. In 1967, ABN and APACL merge and adopt the World Anti-Communist League appeal (World Anti-Communist League, WACL) and extend its activities to the entire Free World. New members include Los Tecos, also called Legion of Christ the King, Mexican fascist formation created during World War II. The League called the first stage of growth during the years 73-75, when Richard Nixon and his security adviser Henry Kissinger in the White House. Its funding is generously insured by the Unification Church. However, this reality is no longer publicly reconoda since 1975. The Reverend Sun Myung Moon then said to have broken their ties with the League, but continues to exert its leadership through its Japanese representative Osami Kuboki. The role of WACL in implementing plans Phoenix (1968-1971) and Condor (1976-1977), including the murder of thousands of suspected sympathizers with communism in Southeast Asia and Latin America, is still not enough documented. Operation Phoenix in Vietnam was probably applied by the Joint Task Force Warfare Unconventionnal Maj. Gen. John K. Singlaub later president of the WACL. However, Singlaub has always denied involvement in that operation. On the other hand, General Hugo Banzer, who imposed his dictatorship in Bolivia from 1971 to 1978, chaired the Latin American section of the WACL.Banzer organized a plan to physically eliminate his opponents communists in 1975. Banzer Plan was presented as a model for a Latin American meeting of the WACL, in Asuncion, in 1977, in the presence of Paraguayan dictator, Gen. Alfredo Stroessner. A motion directed to proceed in the same way, for disposal in Latin America for priests and religious followers of liberation theology was presented by the Paraguayan delegation and adopted by the World Conference WACL in 1978 [9 ]. Neither knows for sure the role of WACL in the strategy of tension that struck Europe during that period. The Frenchman François Duprat, founder of New Order, the Italian Giorgio Almirante, founder of MSI, the Spanish Jesus Palacio, founder of CEDADE, the Belgian Paul Vankerhoven, president of Circle of Nations, and others like them, are active in the WACL. And the League which gets smuggled from Italy to Stefano delle Chiaie , wanted in Italy for terrorism, and sends it to Bolivia, then under the regime of Hugo Banzer, where he immediately appoints second head Klaus Barbie of the death squads. The documentation is minimal also in relation to the role of WACL in the Lebanon war. It is known, at best, who recruited mercenaries integrated the ranks of the Christian militias of former president Camille Chamoun in 1975, weeks before the outbreak of the conflict. On arrival at the White House in 1977, Jimmy Carter wants to end the sordid practices of their predecessors. Admiral Stansfield Turner appointed head of the CIA and is dedicated to eliminating authoritarian regimes in Latin America.It is a difficult time for the WACL, who no longer receive funding from its members. This is then converted into a den of anti-Carter, is preparing for better days and spontaneously established relationships with the leading organization of anti-Carter United States, the National Coalition for Peace Force (National Coalition for Peace Through Strength). That face of rejection comes from the American Security Council, which President Eisenhower designated with the term “military-industrial complex” . Its co-chairs are Daniel O’Graham general , who participated with George H. Bush on the reassessment of the Soviet threat in the Commission Pipes-called Team B  -, and General John K. Singlaub . Numerous officials of the League are linked to the campaign committees for the election of Ronald Reagan. For many, the Republican governor of California is not a stranger. Indeed, at the end of World War II, Reagan participated as spokesman for the Crusade for Freedom (Crusade for Freedom) in raising funds for the establishment in America of immigrants from Eastern Europe fleeing communism. It was in fact transferred to the Nazis and Ustasha fascist members of the Anti-Bolshevik Bloc of Nations (ABN). As Vice President George H. Bush, it is also a friend. As patron of the CIA, was the head of Operation Condor. Since the arrival of Ronald Reagan and George H. Bush to the White House, the WACL regains its former vigor and continues its development. Previous contacts bear fruit. The U.S. military-industrial complex is responsible for financing the creation of a U.S. branch of the WACL under the name of World Peace Council (Council for World Freedom, USCWF). Gen. John K. The Singlaub having as vice president of General Daniel O’Graham. But, the thing does not stop there. The military-industrial complex takes over the WACL to make it a central tool of the global anti-repression. Singlaub thus becomes president of the WACL. To combat the Soviet presence in Afghanistan, the American Security Council  funded a thematic section of the WACL: the Committee for a Free Afghanistan (Committee for a Free Afghanistan) based in the Heritage Foundation. The operation begins on the occasion of an official visit by Margaret Thatcher and Lord Nicholas Bethell, department head of MI6, the United States and headed by General J. Milnor Roberts. The Committee is directly involved in logistical support to “freedom fighters”, awarded by decision of CIA Director William Casey  and run by Osama Bin Laden . The link between the WACL and the Saudi businessman Sheikh Ahmed Salah ensure Jamjoon collaborator of public works emporium Saudi Bin Laden Group, and a former Prime Minister of South Yemen . In the Philippines, President Ferdinand Marcos who represents the WACL. But when it was overthrown in 1986, John K. Singlaub and Ray Cline arrive in the country to choose new partners there. Then create a guerrilla and paramilitary unit deposited in the general preference Fidel Ramos , a friend of Frank Carlucci , George H. Bush and Bin Laden. To combat the Sandinista revolution in Nicaragua, the WACL install a rear base in the ownership of John Hull in Costa Rica with Argentine instructors. The League also uses the facilities offered in Honduras the Chief of Staff, Gen. Gustavo Alvarez Martinez, who recruited mercenaries using as cover to Refugee Relief International humanitarian. In Guatemala, the WACL with Mario Sandoval Alarcon, the leader of the Movement of National Liberation. Sandoval, who was vice president from 1974 to 1978, is the true master of the country since the general-president Romeo Lucas Garcia is just a puppet. Sandoval created death squads that killed more than 13 000 people in five years. In Salvador, the WACL is based on Roberto d’Aubuisson, formed in Taiwanese academia and beneficiary of the aid of Guatemalans. D’Aubuisson becomes at once ANSESAL chief, the local equivalent of the CIA, and leader of a right-wing paramilitary organization, the Republican Party Nacionalista (ARENA). It also creates death squads and killed the Archbishop Oscar Romero. But the success of the WACL also cause their downfall. In 1983, Undersecretary of Defense Fred C. Iklé  at the Pentagon created a secret committee of eight experts, the Council for the Defense of Freedom, chaired by Gen. John K. Singlaub . It is known that the Committee establishes the secret intervention in Afghanistan as a model to extend counseling to Nicaragua, Angola, El Salvador, Cambodia and Vietnam, but not enough documentary evidence of the details of their action. In 1984, Ronald Reagan left to the League in general and in particular John Singlaub set Irangate private financing under the direct authority of Col. Oliver North in the National Security Council. The scandal broke in 1987, destroys everything and destroys the WACL. French political analyst. Founder and president of the Voltaire Network and the Axis for Peace conference. Last work published in Spanish: The Big Lie.Manipulation and misinformation in the media (Monte Avila Editores, 2008). See: “Stay-hebind: U.S. networks destabilization and interference” by Thierry Meyssan, Voltaire, July 20, 2001. The French army lost the battle of Dien Bien Phu on 7 May 1954. On the other hand, the January 29, 1955, Congress carte blanche to President Eisenhower authorized to enter into war to defend Taiwan if the island is attacked by the Communists. See: “Reverend Moon, le retour” text in French, Voltaire, March 26, 2001. Sopasaino Prince, vice president of the National Assembly of Laos, was intercepted by French authorities at Paris’ Orly airport on 23 April 1971. He carried in his luggage 60 kg of pure heroin. S. Ray Cline had been the most listened analyst views the outbreak of the Korean War. He was head of the CIA station in Taipei from 1958 to 1962. Its coverage was as director of the U.S. Naval Auxiliary Communications Center.Then became deputy director of the CIA through a turnover caused by the Bay of Pigs fiasco. Published a memoir, Secrets, Spies and Scholars, Edotirial Acropolis Books, 1976. Michael Laseter was primarily responsible for the Church Universal and Triumphant (CUT) by Elizabeth Claire. In the mid 70’s, the sect was in the midst of a scandal when it was discovered a military arsenal at its headquarters in California. One of its leaders was appointed executive director of the WACL representation in Afghanistan in the 80’s. The School of Americas (SOA) was moved then to Fort Benning, U.S.. Our electronic library offers a comprehensive guide school students in French, from 1947 to 1996. This operation appears to have been conducted in coordination with Monsignor Alfonso Lopez-Trujillo, then secretary general of the Latin American Episcopal Conference (CELAM). See: “1980: slaughter in Bologna, 85 dead”, Voltaire, March 14, 2004. The National Coalition for Peace Force grew to 257 members of Congress. Lt. Gen. Daniel O’Graham was deputy director of the CIA in charge of relations with other intelligence agencies (1973-74) and later director of the DIA (1974-76). Executive Director of the American Security Council, was one of the main proponents of the proposed “Star Wars.” Frontier High founded which he chaired until his death in 1995. In 1975, the far right accuses the CIA of having been penetrated by communist infiltrators and minimize the red menace. President Ford then appointed George H. Bush as director of the Agency and authorizing implementation of a counter-check. Richard Pipes sets “Team B” which publishes an alarmist than justify the resumption of the arms race. Today we know that the Commission deliberately falsified data Pipes for open markets and industrial military complex. On this topic, see: “Washington’s manipulators” by Thierry Meyssan, Voltaire, January 11, 2005, and “Daniel Pipes, the expert haine” text in French, Voltaire, May 5, 2004. John K. Singlaub was an officer in the OSS during World War II.Kuomintang guerrillas set of Chang Kai-shek against the Japanese. During the Korean War, he was head of the CIA station, and later, during the Vietnam War, he led the Green Berets. He was then counterinsurgency instructor at Fort Benning. Moving into retirement, he became director of training of the American Security Council. It was under that post he assumed the chairmanship of the Coalition and, later, president of the League. The National Endowment for Democracy assumes the financing of the Committee since 1984. This shall then part of the funds received humanitarian supplies for their political objectives in Afghanistan, mostly to Doctors Without Borders, Bernard Kouchner, and International Medical Assistance. United States deliberately destabilized Afghanistan, but did not expect the scale of military response from Moscow. Washington then moved his allies to engage in war, not with the aim to “liberate” the Afghan people but explicitly to prevent the USSR could have a step towards the Arabian Sea. In 1983, the WACL shirts printed with the image of Osama Bin Laden and the inscription “Support the Afghan Freedom Fighter. He Fights For You! “(Support to Afghan freedom fighter. He fights for you!). Osama Bin Laden is not presented then as a Muslim believer, but as an anti businessman chosen by Prince Turki, head of Saudi intelligence services, to participate with the United States in the war against the Soviets. Bin Laden first deal to direct the construction of infrastructure needed by “freedom fighters” after administering the procurement of foreign mudjahidines join them. Osama Bin Laden only belatedly transform Muslim believer to establish its authority over them. General Fidel Ramos is elected president in 1992. At the end of his term in 1998, joined the Carlyle Group. See: “Le Carlyle Group, une affaire d’initio” (The Carlyle Group, a case of insiders) text in French, Voltaire, February 9, 2004. See: “L’honorable Frank Carlucci” (The Honorable Frank Carlucci) French text, by Thierry Meyssan, Voltaire, 11 février 2004. Fred C. Iklé was the second of Caspar Weinberger at the Pentagon. This historic fighter of the Cold War is now a member of the Center for Security Policy (CSP) of the Project for a New American Century (PNAC) and manager of the Smith Richardson Foundation. The committee includes generles Harry Aderholt and Edward Lansdale, Colonel John Waghelstein, Seale Doss, Edward Luttwak, the largest F. Andy Messing Jr. and Sam Sarkessian. This entry was posted in crimes against humanity, death squads, How Do We Build the Resistance?, image of the beast, Organizing resistance, The Most Moral Army In the World? and tagged capitalist fascism, state terrorism. Bookmark the permalink.